After a full century of conceptualizing and building the products that have kept your home clean from ceiling to floor, Hoover® has designed the complete floor care solution to fulfill your commercial needs. The Ground Command™ array of products includes a full selection of wet/dry vacuums, floor machines, backpack vacuums, extractors, and air movers—all designed with the legendary Hoover® endurance and quality you've come to trust. With a five year or lifetime warranty almost the whole product line, rest assured; your investment will continue to save you time and money for years to come. 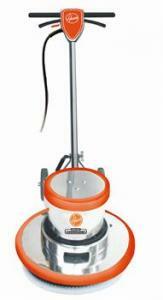 17" Floor Machine: Scrub with a 15" rotary brush or a 16" pad and pad driver with a 1" rises and "B" style clutch plate. Pad driver sold separately.